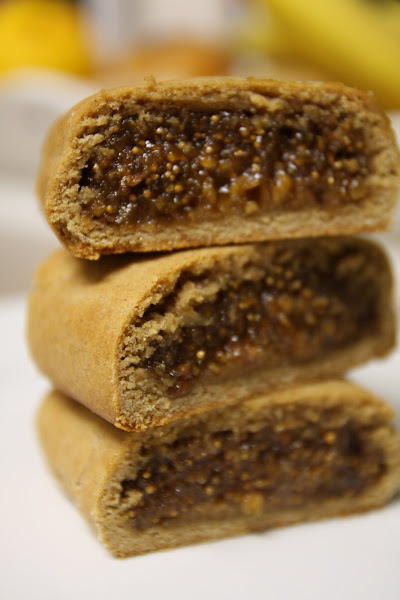 A few months back my friend Piper sent me a batch of homemade fig newtons and the second I tasted them I immediately knew that I had found my new favorite cookie. Well, after talking about them incessantly since then The Don and I finally gave baking them a try. The recipe Piper used came from Maida Haetter's Cookies. Maida calls them "Big Newtons" (Pg 228 in the new book). They came out so well and, just like the ones Piper sent, they were filled with the sweetness of fig, honey and natural fruit juice. I highly recommend this recipe and this book for that matter. I must admit that they were pretty labor intensive but they were really fun to construct and left the apartment smelling almost as good as the cookies taste. Once cut, they look like little pieces of art so they make a great gift when piled up in a pretty box.